Williams has PLENTY to keep you busy! 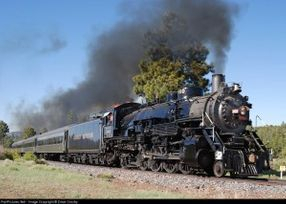 Walk to the famous Grand Canyon Railway station and take the train to the Grand Canyon. Visit Bearizona's Wildlife Park. Play golf at Elephant Rocks Golf Course. Shop for gifts and art along Historic Route 66. Listen to live music while you dine at one of the many restaurants within walking distance. The immediate area features 7 mountain lakes, hiking trails and scenic drives. Annual festivals include Classic Car Shows, Rodeo Events, Parades, and a genuine small-town America feel. Williams is home to the Grand Canyon Brewery, Historic Brewing Company and up-and-coming wineries. The beautiful red rocks of Sedona are just to the South. The ski resort in Flagstaff is 30 miles East. Known as 'the gateway to the Grand Canyon', Williams offers activities, scenery, history and clean mountain air. This is the closest vacation rental to Route 66. Next door to the grocery store and walk-able to the train station... Speaking of trains, we promise you will hear one! If you're lucky, it will be the historic steam engine that runs in the summer months.